Having kids in all grades read multivolume book series pays off in student fluency and engagement with reading. 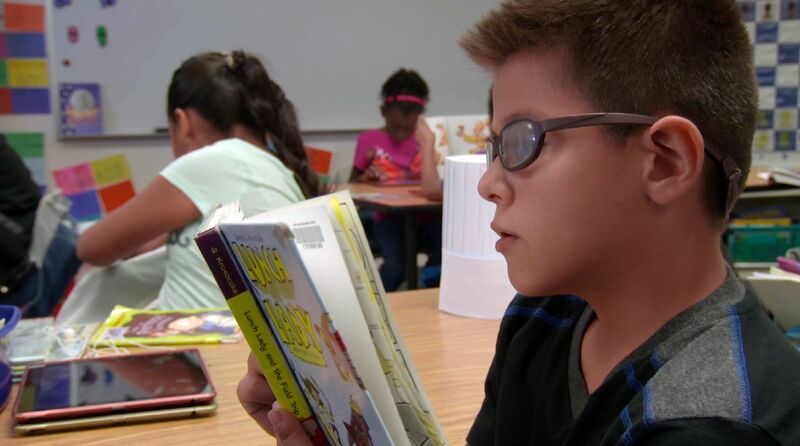 At Walter Bracken STEAM Academy Elementary, a Title 1 magnet school in urban Las Vegas, Nevada, educators have created a culture of reading by introducing Series Reading across all grade levels. By fifth grade, students are two and a half years above grade level on the STAR Reading Assessment. Instead of talking about the latest TV shows, students excitedly discuss the books they read. Students are often caught reading books under their desks during other lessons. "Kids are hungry to read," explains Anna Hurst, Walter Bracken's assistant principal. "They come in on a Friday and ask me, 'Can I check out two books?' because they want to take two books home on the weekend." The Series Reading program supplements curriculum. "That reading program gives me more hours than any other teacher," says Klaus Friedrich, a Walter Bracken fifth-grade teacher. "I feel like I'm at a higher-level middle- or high-school ability with them as far as understanding plot, character development, complexity, and style because I'm not spending a lot of time on fluency." Walter Bracken didn't always have a culture of reading. A lot of their kids weren’t finishing their books at home. They would read a chapter and stop, and they weren't doing their reading logs. To remedy this, teachers introduced Series Reading to their students. They deepen their connection with the books’ characters. They don't waste time trying to decide what book to read next. They are familiar with the characters. They are familiar with the vocabulary that the author uses. That familiarity helps increase success and understanding with each book in the series. Share their excitement for reading with students and discuss the books. Know what books students are reading and when they're checking them out. Take part in creating a culture of excitement around reading. Have staff members select a book series that they know and enjoy. Purchase books and store them in the classrooms and staff offices. Ask for used book donations. Create a Target gift book registry. Purchase more than one of each title so that multiple students can read the same series at once. Bracken purchases six of each title. Walter Bracken teachers initiate a benchmark test using the Accelerated Reader (AR) program, and they use AR quizzes to test students on their comprehension after they finish each book. This assessment helps teachers to know whether or not their students understand what they're reading. With this benchmark, students get to read at their level, differentiating their learning, and they can choose which series within their level they want to read. Teachers use colors to represent each reading level. They put colored dots (pink, blue, orange, etc.) on the spines of each book so that students know whether the books are within their reading level. They also have a website listing each series by grade level and color code to help students decide which series to read next. It's free for up to 200 students. You can create paper or computer quizzes. You can assign a point system for each book completed. You can have unlimited users. Students can take quizzes online. Create paper quizzes on each book. Place a basket in your classroom for students to drop off their completed quizzes. Students at Walter Bracken are acknowledged and rewarded when they achieve their reading goals. Their progress is tracked through the Accelerated Reader program. AR assigns points to students based on how much they have read and the level of difficulty at which they're reading, and teachers use this data to gamify students’ reading. 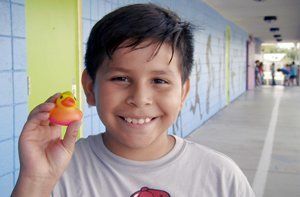 For lower elementary, students are motivated to read at first because they're excited to get the rewards, like trophies or wearable trinkets. As they get older, it becomes less about the incentives. The rewards help build the habit of reading, but it's the reading itself that engages the students. 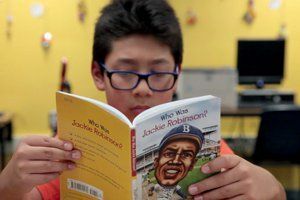 "Sometimes the books are so interesting that I actually feel that I'm in the book," says Braulio, a Walter Bracken fourth-grade student. Walter Bracken purchases their rewards at fitnessfinder.net and orientaltrading.com. For a low-cost alternative, Decker suggests hanging a chart on your classroom wall to showcase which series your students have completed. The school also asks their graduating fifth-grade students to donate their charms back to the school. Most kids do, and those charms can be cleaned and reused. When Walter Bracken first created the Series Reading program, the younger students would spend ten minutes looking at all the covers trying to find the right book, because they didn't know which book in the series came next. Teachers solved the problem by creating series bookmarks (PDF). Each book series has its own bookmark displaying the titles and covers of each book. This helps students easily identify the order of the books within a series, helps them keep track of which ones they've read, and is also a place to record their AR score for each book. When each student begins reading, they get a face bookmark. 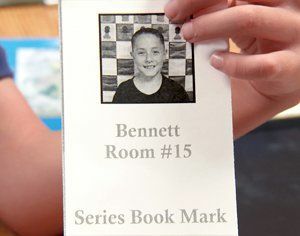 Completely unrelated to the popular social media site, these are bookmarks showing the student's face, his or her room number, and the teacher's name on the front. The back of the bookmark is full of blank lines for students to fill in which series they've completed. At a glance, this helps teachers to identify how far their students are in their reading, and it also helps staff track which students have their books when they need to collect them at the end of the year. These face bookmarks serve as sign-out slips. When students check out a book, they leave their face bookmark with the staff. "Stick to the series idea," advises Decker. "It's tricky at first, but it will pay off. Be flexible. You are changing bad habits for older kids. The younger grades are the easiest to start!"